Simultaneous group treatment of the relatives of patients allows better contact with the family. Any possible abnormalities in the patients’ family environment come to light much earlier, so that the therapists can come to grips with them. Since as a rule we appoint two therapists to lead a group, so that they may check and complement each other, it is also possible to appoint as co-therapists beginners in group psychotherapy or those requiring further training. This possibility, combined with the creation of training groups and the appropriate courses, means that the hospital is able to offer training to new group psychotherapists. 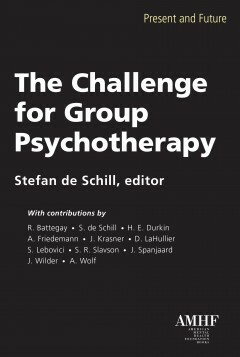 Group psychotherapy with large, nosologically varying groups; with small diagnostically homogeneous groups; and with groups of doctors, nurses, and relatives results in a more active therapeutic atmosphere and, above all, permits the mentally sick to be diagnosed and treated in their proper social context. If we use it simultaneously with other methods, treatment is directed not only at the individual but also at his social involvement. We can measure, by the patient’s attitudes and reactions within the group, to what influences he was exposed in his early childhood and later or is still exposed to today and also what environmental factors have had, or are having, a pathogenic effect upon him. It might be assumed, from our comments up to this point, that we recommend unrestricted group psychotherapy. In this context we must remember that collective treatment runs, for example, the risk of forming mobs or gangs. And group psychotherapy can scarcely do as much for the individual as the deeper penetration of his own problems. In certain circumstances, moreover, group therapy can have an unfavorable effect on some patients: for example, agitated depressives, manic patients, schizophrenics with very weak egos, hyperthymics, hysterical and attention-seeking or querulous personalities. The group and its dynamics suffer through the participation of such patients, so that they have to be excluded from collective treatment. However, all these disadvantages and contraindications cannot hide the fact that the introduction of group psychotherapy into clinical psychiatry is a further step towards comprehensive treatment of the mentally sick. But all the same we shall have to continue to seek out methods that permit an even better and more flexible approach to mental illness. Group psychotherapy should not be considered a more superficial method than individual treatment. On the contrary, the reinforcing effect of the group on the emotions often helps the participants to reach depths of experience that could scarcely be expected in so short a time or at all from individual psychotherapy. Qualitatively, the group achieves different psychological effects from those arising from the dual psychotherapeutic situation. The group is particularly fitted to reactivating in the participants’ imagination past or present collective situations, whereas individual psychotherapy brings out relationships with individual persons in the past and present. In the (therapeutic) group, too, the “Great Mother” comes to life much earlier than in individual psychotherapy. Group psychotherapy is thus not only quantitatively but also qualitatively different from individual treatment. It is not merely a method of seeing more individuals at the same time. On the one hand, it is true, we are not of the opinion of Preuss (1966), who states that group psychotherapy does not allow more patients to be treated in the same period of time as with individual therapy. But on the other hand we agree with him that group psychotherapy is not purely a way of saving the doctor’s time. Group psychotherapy has its specific effects and thus, in exactly the same way as individual psychotherapy, it is indicated in specific cases. The fact that the patients are not only dealt with by a therapist but also surrounded by fellow sufferers means that the therapy is in the hands of a collective, not a single person. With the help of the group, the therapist has an easier time than if he were working alone. Often a member of the group will give an interpretation that will save the therapist from having to intervene. But on the other hand the therapist’s task can also be more difficult in the group. Not only does he have to steer his way through a many-sided transference situation on many different levels, but the fact that untrained persons are taking part in the group activity makes his therapeutic work difficult. It is true that an interpretation made through the group often makes more impression on the patients than if the work were done by the therapist exclusively. But we can never expect from a group the subtle approach that we can from a trained analyst. The individual relationships in a group are never as intensive as they are when only two persons are concerned; but the total intensity of the individual relationships in a group is usually greater than the emotions that come up in individual therapy. The confrontation of two individuals in the group is never so intensive as in the dual psychotherapeutic situation. The individual in the group can always avoid an argument with another member, while in the classic psychotherapeutic situation the confrontation must take place. For that reason individual psychotherapy is much more suited to working through a conflict situation than is the therapeutic group. In the intimate relationship between doctor and patient in psychoanalysis it is very difficult to avoid a confrontation; but in the collective situation a patient’s resistance can more easily and unobtrusively find a way to sabotage the therapist’s efforts. Although all the members, and the group as a whole, can consciously or unconsciously help to discover and dispel the very intensity of interaction in a group can cover the resistances—skillfully camouflaged—of individuals. For that reason we look upon individual psychotherapy as a more thorough method than collective treatment. As a rule it gives better scope than the group method for making a thorough examination of whatever conflicts emerge. Greater thoroughness, however, is not to be confused with greater depth. As we have said, group psychotherapy—often in a very short time—can reach emotional depths that we scarcely ever see in individual treatment. However, simply because several individuals are taking part at the same time, the group cannot consider questions that arise in such detail as in individual therapy. Group psychotherapy, as we said in the last chapter, makes it possible much sooner than in the dual psychotherapeutic situation to recognize typical attitudes of the individual and of the whole group. Especially because so much interaction is going on in the group, individuals are constantly led to take up new positions or to react in the accustomed way to new situations. Whereas individual psychotherapy permits an analysis of “content,” a psychotherapeutic group gives a special opportunity for analysis of “attitude.” To take an extreme case, we may say that a patient in individual analysis can gain a comprehensive insight into his basic problem but has not necessarily the opportunity to learn new, healthy standards of behavior. Everyone who has experience of both fields [group psychotherapy and individual psychotherapy] will agree that the therapeutic results are quite different, although it is hard to say exactly in what the difference consists. Let us nevertheless try to give a definition, sketchy and badly documented, which will at least show the direction in which this difference is to be sought. We could perhaps say that after successful psychoanalytical treatment the patient is distinctly less neurotic (or psychotic) but perhaps not absolutely mature; after successful treatment with group methods the patient is not necessarily less neurotic, but distinctly more mature. These concise definitions are not meant to be taken literally but simply as an attempt to fix the special essence of the two psychotherapeutic methods. The very fact of the multiple and multidimensional transferences that take place in the group must lead to a working out of neurotic conflicts. Similarly, the dual psychotherapeutic situation also offers an opportunity to recognize and dispel abnormal attitudes. In individual therapy those in analysis report their (social) experiences in the interval between the sessions; so in individual therapy too there is a constant process of deconditioning and reconditioning. We cannot say, therefore, that individual therapy does not permit experience of reality. Nevertheless, the therapeutic group, with its close-knit interaction and its intense reality, is usually in a better position to show the patient the external composition, the principles, and the coordination of society. In group psychotherapy the participants are drawn into analytical work and a social learning process at one and the same time, while individual psychotherapy separates analytical explanation and social learning. From this spring the advantages and disadvantages of both group and individual therapy. The fact that group psychotherapy aims simultaneously at analysis and social experience makes it a timesaving method, since two therapeutic processes move parallel to each other. However, as we have already said, there is the danger that it may not be thorough enough and perhaps may try too hard to conform with reality. Individual psychoanalysis, on the other hand, has the possible disadvantage that social data are not sufficiently taken into account in the therapeutic work. An essential difference between individual and collective psychotherapy is that group treatment makes it possible for individuals to gain in self-knowledge. Speaking in front of an interested group is often enough in itself to give them greater self-confidence. On the other hand an adequately constituted group does not allow an individual to monopolize the conversation. It is scarcely ever possible for a member of the group to focus the attention of the others upon himself for any length of time; and nor can any member keep his own attention upon himself for long. The group has a wide variety of interactions, and its different members expect and demand a variety of different things. It will not allow libido to be more or less completely withdrawn from objects and directed upon anyone’s personal ego. We have repeatedly observed that patients in individual analysis who belong to a psychotherapeutic group obviously have not sufficiently dissipated their (secondary) narcissism (Freud, 1917), in the dual psychotherapeutic situation. If they were then attacked somewhat harshly by the group, they might at first react in a very sensitive way. There was even the risk that they might leave the group. But if they carried on with the therapeutic group, they generally succeeded in becoming conscious of their narcissistic tendencies and gradually to work through them with the group. A member of a doctors’ group stressed that he had a very friendly relationship with another member of the group who worked with him. Another member, however, burst out with the assertion that she had come across this doctor in the course of her work and remembered him vividly. He had, she said, called her in to discuss a patient whom she had referred to him, and he had kept her listening for about two hours to a discussion between himself and the patient, without giving her the chance to speak. She had perceived that she had been made to play a secondary part. From that moment she remembered him most distinctly as a domineering type. The colleague addressed grew red, was obviously hurt and indignant, and tried to shift the blame for the difficulties between his colleague and himself onto the patient, who had very serious problems. But she persisted in her assertion that he had struck her as very authoritarian. Although his self-love had obviously received a blow, he appeared gradually to be considering what she had said. It was apparently becoming clear to him that he could not maintain in the group his narcissistic fiction of being an important, inaccessible person. We saw in this way that the narcissism of a group member who had already gone through an individual psychoanalysis could be successfully called in question by another member in front of the group. The presence of the group was by no means unimportant. In fact another member twice commented on the behavior of the doctor who had been so harshly attacked, saying that he behaved oddly and spoke almost unintelligibly; he added loudly that he was sitting on his high horse quite unjustifiably. In a dual therapeutic relationship in which the psychoanalyst is occupied exclusively with one patient, the subject of narcissism can, it is true, often be brought up in exactly the same way by the therapist. But the fact that the analyst is concentrating all his attention on the patient for a considerable time may even strengthen his narcissistic tendencies. For this reason it is desirable that every individually trained therapist should also join an analytical training group. This would not only give him the chance to discover his own unconscious motivations of the kind that come up in a collective situation, and to understand his patient in his social environment; it would also help him to recognize and dispel his narcissistic tendencies, which can only cloud his vision and hinder his approach to the patient. If, however, a group member is too hard pressed by the intensive reality of the group, there is the danger of his libido being thrown back upon the ego. When schizophrenics take part in a psychotherapeutic group, the libido which they had centered upon themselves may often be directed more towards the others; but the reverse can also take place, and their narcissistic tendencies become still more marked. The group reality has demanded too much from them, so that they now withdraw themselves from it completely. This is to say that the intense degree of reality of the therapeutic collective can not only help to mitigate every kind of egocentricity, even autism, but occasionally it can lead to an even more persistent withdrawal from external reality. Group psychotherapy brings outward reality much nearer to the individual than does individual psychotherapy. However, the outside world can press upon an individual so strongly that if the ego is weak there is a complete withdrawal from the world. Schizophrenics with weak egos do not as a rule find any menace in individual psychotherapy, though they occasionally do in group psychotherapy. The “we consciousness” of the group is more likely than anything in individual psychotherapy to bring confidence and a feeling of support. It may happen, however, that an individual who is shut up in his own narrow world, such as, for example, a depressive or a paranoid schizophrenic, can no longer shut his eyes to the many-sided processes of the group operating on many different levels; the therapy can then lead to serious suspicions much earlier than with individual treatment. A patient in classic psychotherapy will scarcely ever doubt or even despair of his fellow men to the extreme degree that we have seen in collective psychotherapy. It can perhaps be said that individual psychotherapy is more intimate than group treatment. But this does not mean that intimate problems come out only in tête-à-tête. On the contrary, the reinforcing influence of the group means that the participants often divulge their deepest concerns, expectations, and impulses at a very early stage—usually more quickly, in fact, than would have been the case in individual psychotherapy. But they are induced to do this by the other members of the group, and their confessions are often made too soon, so that they later regret having said anything. Then as a rule they feel deserted and imperfectly understood. But usually the therapeutic group absolutely guarantees the intimacy that is indispensable for the formation of transferences. Naturally the transference relationships in a group are considerably more complicated than when only two people are involved. In the group situation one member can form the most diverse transferences simultaneously to the other participants and to the group as a whole. At the same time transference impulses go out from other members, into which a member is not necessarily drawn. So, as we have already said, the transferences in a group are multiple and multidimensional; from the point of view of a member they are many-sided, and from the point of view of the whole group they are many-layered, that is to say that different transference processes can go on side by side. Rivalries with other group members and authority images of the therapist may, for example, be built up simultaneously by a participant (multiple transferences). In addition, while, for example, one participant is involved with another in sibling rivalry, others, on a different level, may be engaged in conflict with the therapist as an authority figure (multidimensional transferences). Our experiences show that in therapeutic groups the problem of authority often appears more readily than in the dual psychotherapeutic situation. A therapist working in a group as its leader clearly brings out original authority images in the life history of individuals earlier than in the dual therapeutic situation. Sibling rivalries too often come to light in the group very early and very distinctly. A member of a doctors’ group betrayed his more or less unconscious intention of raising himself above the others by asking probing questions of one member after another. He did not stop until a member protested vigorously against his behavior. In the discussion that followed it became clear that this doctor—probably unconsciously for the most part—was laying claim to leadership, because in this way he would gain the upper hand over his colleagues, whom he saw, in transference, as brothers and rivals. It is true that similar anachronistic fantasies of rivalry and authority are relived also in the dual situation of classic psychotherapy. But the intimacy of the dual situation causes problems of power and rivalry to come up, or at least to become clear, more slowly. The mirror effect of the group often leads to the members becoming aware of their authoritarian and competitive behavior earlier than those treated individually. Resistances, like transferences, are more complex in group psychotherapy than in the dual situation. They too are multiple and multidimensional, and for that reason are often more difficult to disentangle than in the classic analytical situation. The task of “leading” a therapeutic group is more difficult for a therapist than the function of an individual psychoanalyst. The group analyst not only needs training in social psychology besides his knowledge of depth psychology; the fact that he is caught in a crossfire of transferences and resistances and that at the same time emotional processes are taking place in the group by which he is not directly affected, makes his work extremely difficult. There is no objective basis for the common assumption that the task of leading a therapeutic group can be simply allotted to a doctor, without any further consideration. I had enough experience, at the beginning of my group work, of what it means to cope, unprepared, with the “leadership” of psychotherapeutic groups. In individual psychotherapy, ignorance of the laws of depth psychology can do harm to one single person, but in the group, damage can be caused to several individuals at once. In group psychotherapy complications are possible directly, through the unfavorable psychological influence of the leader on the participants or of the participants on each other and also indirectly, if social processes develop that result in an unfavorable psychological effect on the members of the group. For instance, a group can degenerate, especially if unsuitably directed, into a “mob in miniature,” in which individuals no longer fulfill distinct functions but simply follow blindly, without any responsibility of their own. But it can also turn into a “rabble in miniature.” Although the participants are still sitting side by side, they no longer have any emotional rapport with each other. They have “mentally emigrated” (Muchow, 1959) and have no real relationship with anyone else present. Such a degeneration can be seen when reciprocal influences are too closely interwoven and people fear the loss of individuality and independence, and so withdraw into themselves. We need no further demonstration of why both the degeneration to a “mob in miniature” and the change to a “rabble in miniature” have an unfavorable effect on individuals. The many and various interactions in the therapeutic group give it a strong sense of reality; this feeling of “here and now” is of much greater importance than in classical psychotherapy. It is perhaps largely due to the effect of group treatment on individual psychotherapy that we have learned to pay more attention, even in the psychoanalytical dual situation, to the actual evidence of the patients’ words and behavior towards the therapist. It is true that we have, since Freud, seen that the transference neurosis is essential in psychoanalysis. But we have also learned through our experience in group psychotherapy that it is not only a matter of helping the patient to acquire insight; we must also be continually questioning deviant behavior in the present relationship of the patient to the doctor to “decondition” it and make it possible for the patient to practice new attitudes and conduct. Group psychotherapy goes deeper under certain circumstances than individual treatment, but individual therapy is more thorough. Treatment through the group shows more impressive results, but the dual psychotherapeutic situation permits a more subtle approach. In the therapeutic group consisting of several members it is easier for patients to opt out of the effort of participation than in individual treatment. Resistances and transferences in the group are many-sided and operate at many different levels. They are therefore usually harder to keep a check on than in the classic psychotherapeutic dual situation, in which, at least up to a certain point in time, transferences and resistances are more clearly defined. In the group, with its greater intensity of interaction and reality, the therapeutic purpose is an analysis of attitude—which of course is always accomplished at the level of basic conflicts—rather than of content. In psychoanalysis, on the other hand, with its more intimate relationship between therapist and patient, greater weight can be placed on the analysis of the stuff of which conflicts are made. We can, like Balint (1962), put it in a grossly exaggerated form and say that group psychotherapy leads to a maturing process but no cure for neuroses, and psychoanalysis cures neuroses but does not mature. More moderately expressed, we mean that in group analysis the processes of deconditioning, reconditioning, and social learning play a more obvious part than in individual psychotherapy, while in individual psychotherapy more stress is laid on insight and on the working through of problems. The group, with its more intensive interaction, allows secondary narcissism to be dispelled better than does the dual situation of psychoanalysis. In group psychotherapy the problem of authority often appears earlier than in individual psychotherapy. As a rule the intimacy of the psychotherapeutic tête-à-tête is slower to allow problems of power and rivalry to emerge. It is therefore possible to recognize and deal with the conflicts connected with them more quickly in collective psychotherapy. Group psychotherapy, for its part, has influenced individual therapy in the sense that it has led to greater attention being paid to the situation as it is at present.